Arghh I got too excited by this giveaway and couldn't wait until tomorrow to post it, so here it is now. Like I mentioned yesterday me and the JEMspenk decided that instead of doing a beauty giveaway like we normally do, we thought we would give away some one of a kind clothing. After all "Who is She" is foremost a fashion blog. So the other week while shopping in Middlesbrough (tip- the Topshop there is fab for finding stuff), I called into my favourite vintage store Deep Clothing and picked up these little gems. If you remember my holiday outfits I had a blue dress from there in the same style, I've also got an animal print one which was hiding in my suitcase which will be coming out to play when I go away in October. The prize is something which both me and JEM would wear. Now both dresses are classed as One Size. I can fit into them, and JEM and her massive baby boobage can fit into them, I'm going to say the dresses will fit a size 8-14 possibly a small 16. Both dresses are elasticated at the top and waist. So how can you win one of these..
You must be a follower of the blog (we will be checking). 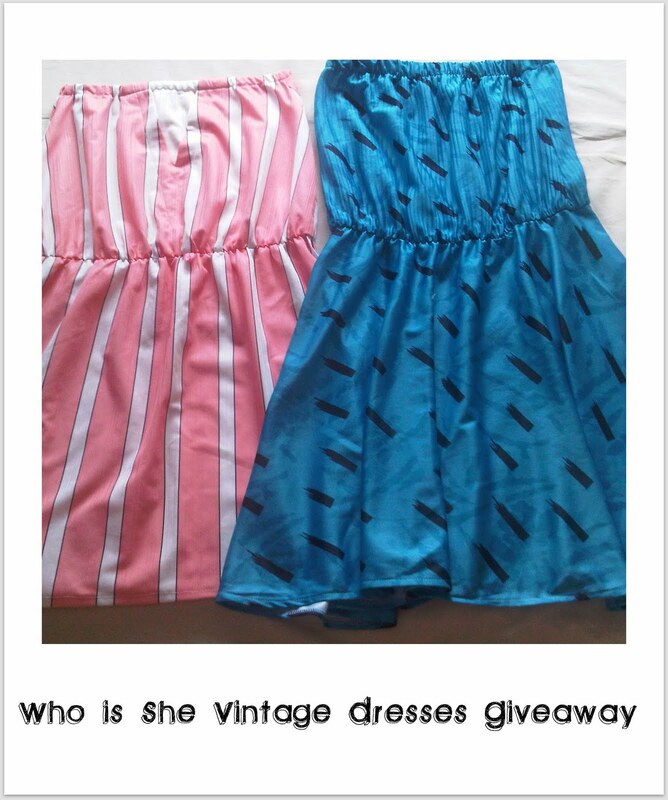 Write an "enter me" comment below, leaving your name, email address and which dress out of the two you prefer. For an additional entry, place the picture below in the side bar of your blog. Closing date will be midnight on the 24th September. enter me please! Fern, fernlaura5@yahoo.co.uk, i like the blue dress best! Fab giveaway - enter me please! I prefer the blue dress :). u know my email address! enter me pleaseee :) following you since months now! Enter me please gorgeous, this is such an amazing giveaway! I need that pink dress in my life!! I prefer the blue dress! Enter me please! Love love love that pink dress!! Enter me please! I just love that blue dress!! my email address is prettyinthedesert@gmail.com. Ah! This is amazing! I'd love the blue one. 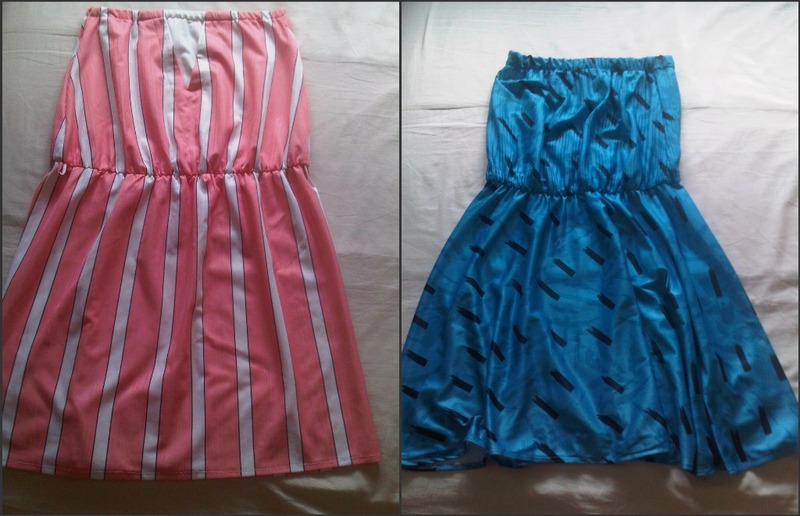 I like the blue one best..
love both dresses, but my pref is leanin twds the blue one. I like the pink dress best. I prefer the blue one! please enter me! 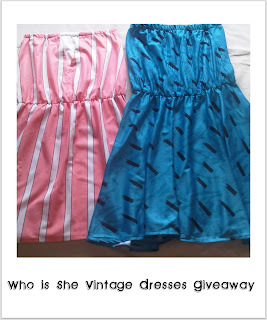 i absolutely love both dresses so would be happy whichever i won!